Lunch will be available starting at 11:45am *********************************************************************************************************************************** The evolution of the grid faces significant challenges if it is to integrate and accept more energy from renewable generation and other Distributed Energy Resources (DERs). To maintain grid's reliability and turn intermittent power sources into major contributors to the U.S. energy mix, we have to think about the grid differently and design it to be smarter and more flexible. ARPA-E is interested in disruptive technologies that enable increased integration of DERs by real-time adaptation while maintaining grid reliability and reducing cost for customers with smart technologies. The potential impact is significant, with projected annual energy savings of more than 3 quadrillion BTU and annual CO2 emissions reductions of more than 250 million metric tons. This talk will identify opportunities in developing next generation control technologies and grid operation paradigms that address these challenges and enable secure, stable, and reliable transmission and distribution of electrical power. Innovative approaches to coordinated management of bulk generation, DERs, flexible loads, and storage assets with multiple roles, and revenue streams will be discussed. Summary of ARPA-E NODES (Network Optimized Distributed Energy Systems) Program funding development of these technologies will be presented. Dr. Sonja Glavaski is a Program Director at the Advanced Research Projects Agency-Energy (ARPA-E) overseeing portfolio of projects developing innovative and disruptive technologies that would facilitate energy efficiency, more efficient renewable energy generation, and enable electricity grid to be more responsive and resilient. Her technical focus area is data analytics, and distributed control of complex, cyber-physical systems with emphasis on operations and security of energy systems. 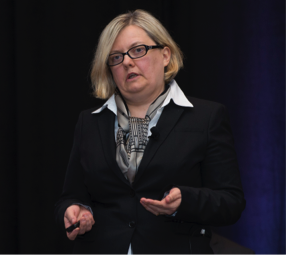 Dr. Sonja Glavaski spearheaded development and is currently helming ARPA-E NODES Program that aims to develop transformational grid management and control methods to create a virtual energy storage system based on use of flexible loads and distributed energy resources (DERs). Prior to joining ARPA-E, Dr. Glavaski served as Control Systems Group Leader at United Technologies Research Center advancing knowledge and technology in the area of control & intelligent systems. Before being at UTRC, Dr. Glavaski led key programs at Eaton Innovation Center and Honeywell Labs. During her 20-plus-year career, Dr. Glavaski has contributed significantly to technical advancements in numerous product areas, including energy systems, hybrid vehicles, energy efficient building HVAC/R systems, and aircraft systems. Dr. Glavaski received Ph.D. and MS in Electrical Engineering from California Institute of Technology, and Dipl. Ing and MS in Electrical Engineering from University of Belgrade.